Dr. Ned Robert was finishing up his cardiology fellowship at the Stanford University School of Medicine when he was inspired by a presentation about an emerging procedure to unclog blocked coronary arteries. 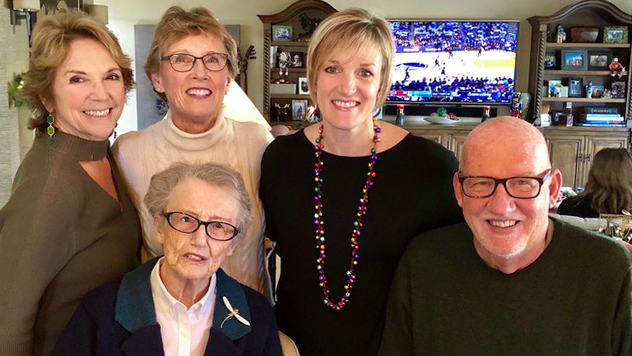 The talk would change the trajectory of his life, and allow the Oregon alumnus to generously give back to the university that had given him and his family so much. After the lecture, Robert, who graduated from the UO with a bachelor’s in biology in 1969 and from what was then the UO’s medical school in 1973, teamed up with a colleague and eventually developed a new technology to perform a procedure called balloon angioplasty. In 1978 they formed Advanced Cardiovascular Systems to manufacture and market it. Demand was immediate for the groundbreaking, minimally invasive technique in which a small catheter with a flexible guidewire is threaded through a patient’s bloodstream into a blocked coronary artery. Doctors briefly inflate a balloon at the end of the catheter to remove the obstruction. Four years later, Robert and his partner were approached by pharmaceutical giant Eli Lilly, which purchased their company, rewarding the two doctors after years of research and hard work. All along, Robert had kept the UO in mind. His family has deep ties to the university, and he essentially grew up on the campus. His mother is a Duck. His father is a double Duck who also taught business law in the Lundquist College of Business. Robert and his sisters all followed in their footsteps as Ducks. The university did a lot for Robert, and he wanted others to benefit from it, too. An opportunity emerged last year when UO president Michael Schill allocated a portion of a $50 million anonymous gift to match $1 million investments in faculty excellence chairs. This spring, Robert and his partner Carol Ezeir gave $1 million — matched by the president’s fund — to endow what will be named the Robert Family Chair within the biology department. The gift comes as the university begins to ramp up faculty hiring in the sciences in preparation for the opening of the Phil and Penny Knight Campus for Accelerating Scientific Impact. It’s also part of a larger effort to keep and attract top-notch faculty. “I think it’s going to help students, and it’s going to attract better students,” he said. Hal Sadofsky, College of Arts and Sciences associate dean, said the timing of the gift was perfect. Robert’s generous gift was enabled by his keen foresight and the bold initiative he took nearly 40 years ago with balloon angioplasty. “It very quickly became the standard of the industry,” Robert said of their invention, which paved the way for additional breakthroughs in the medical field. Robert remained in the Bay Area and continued his career as a successful cardiologist. However, his ties with the place he called home for so many years endured. They trace back to when he was a boy, and the UO campus served as a sprawling playground for Robert and his buddies. He learned how to swim in what was then called the men’s pool and went to elementary school in what is now Agate Hall, across the street from Hayward Field. He graduated from nearby South Eugene High School. As a Duck, he forged friendships with fraternity brothers that he maintains to this day. “I’ve felt a part of the university ever since I was a little kid,” he said. Over the years, he’s supported the university in other ways. Robert established a scholarship for Lundquist College of Business students to study abroad, a nod to a time when his father taught in Holland as part of an exchange program and brought the whole family along. He also gave to the capital fund during the business college’s renovation — a classroom in Peterson Hall bears the name of his father. He also donated to the Ford Alumni Center’s construction, along with a number of other gifts. But he’d longed to give in a way that really reflected his family’s deep connections to the UO. Although his father passed away years ago, his mother still lives in town. She’s a regular at Beall Hall during the Oregon Bach Festival and supports the Ducks’ sports teams as well. And while his daughters went to college elsewhere, Robert makes sure to put a good word for the UO in the ears of his grandchildren. So the decision for him to name the endowment the Robert Family Chair was an easy one. “It’s for my parents, for my sisters, for my daughters, my entire family,” he said. Robert’s excited to think about how his gift will leave a lasting mark on a place that has evolved beyond belief over the 60-plus years he’s known it, a place he holds dear to his heart.